New Year’s Eve and New year’s day in Bulgaria are celebrated pretty much as everywhere else. 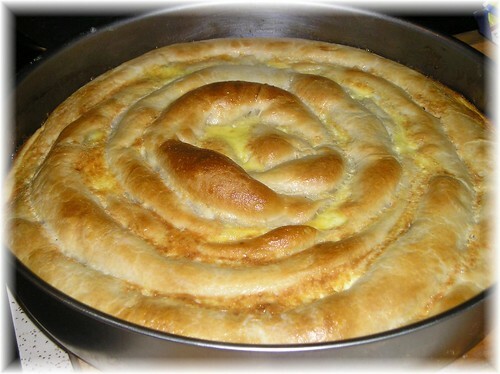 However, one part of the tradition that is preserved to present days is the Banitsa s Kasmeti. 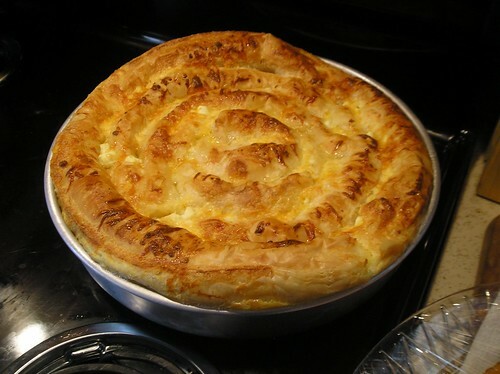 Traditionally Banitsa s Kasmeti is a round cheese and eggs phyllo dough pastry that has the Kasmeti (lucky verses) wrapped around European cornel branches and baked with them. 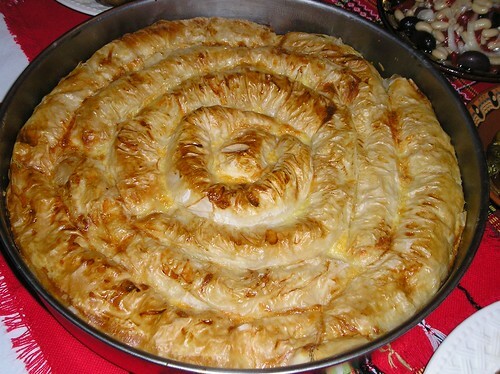 In the first minutes of the New year the banitsa is placed in the middle of the table then the oldest woman in the house turns it 3 times clockwise and cuts a piece for everyone. Usually you get the piece that is closest to you. A Kasmet is a little piece of paper with a lucky verse that is believed to hold a magical power to bring luck to you next year. Traditionally these verses were consistent of only one word like Helath, Work, Baby, House etc. Nowadays Bulgarians are using rhyming verses that bring more fun to the tradition. One other change in the traditional way is that today each Kasmet is wrapped in a piece of foil and then placed in the banitsa. 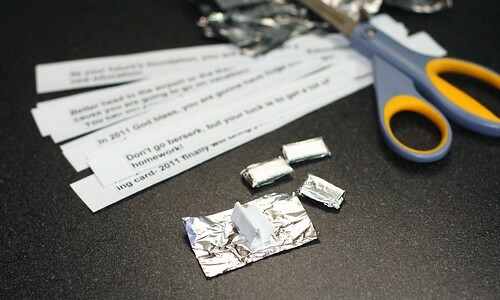 This is more practical since it keeps the paper from getting greasy and makes the reading and unfolding easier. Four years ago I started looking for Kasmeti in English, because I wanted to share this tradition with my American friends but I couldn't find any. So, I decided to sit down and write them myself. Since then I have shared these Kasmeti with a lot of friends- Bulgarian and English speaking and I decided that instead of sending the Kasmeti each time in an e-mail, I can just post them as New year's present for all my readers to use. *One other way to use these Kasmeti is to wrap them in foil over a toothpick ( if you don't want to bake them in the banitsa) and then cut the banitsa in small pieces and place one on each piece. I did that for my son's school, since it's much more easier for the kids to get the bite sized pieces. Disclaimer: Although I am providing these files for everyone to use for FREE, I would like to ask you to be respectful of my time and effort and to show the courtesy to give me credit by providing a link to the original source- my website, if you decide to post them somewhere on the web. Thank you!